Let's face it, everyone want convenience and unfortunately, transacting with government agencies is such a pain and time consuming. Thank goodness for our malls which turned into community places where one can enjoy shopping, dining, and transacting businesses under one roof. I recently found myself missing a copy of my NSO certified birth certificate, I realized I gave out the last one I have when I applied for the New Postal ID even though it's clearly stated in their website that they will only take the photocopy and not the original. Moving on, I was about to go to NSO's main office in East Avenue but having trouble going out because of the rainy weather earlier this month. 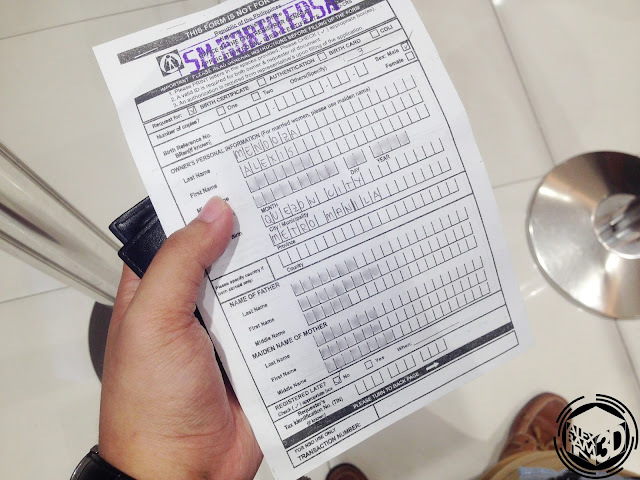 After doing a little research, I found out that SM Supermalls processes NSO birth certificates as well, aside from other government transactions such as SSS, PAG-IBIG, PhilHealth, DTI, and more. Since I am in no rush to get my copies, I decided to give their service a try. 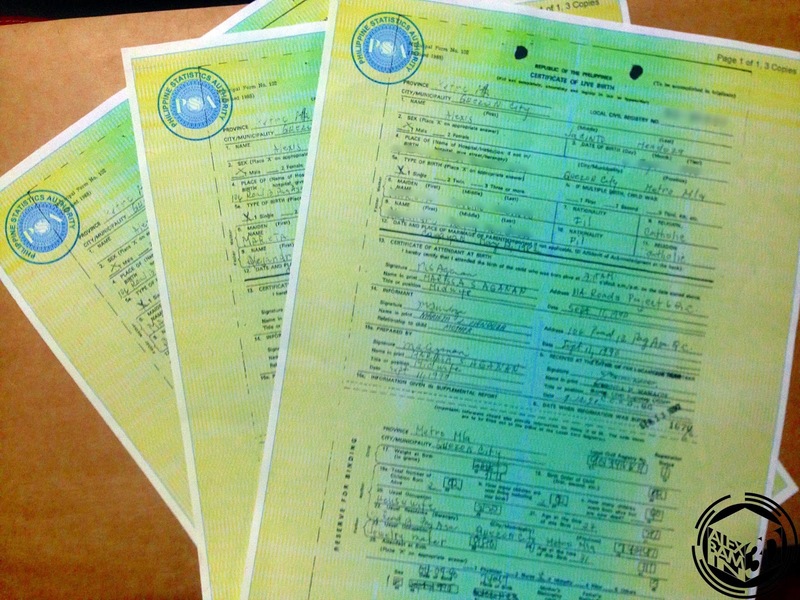 How to request a copy of your NSO Birth Certificate at SM Business Center? Requesting for a copy of your NSO certified birth certificate is quite simple and just takes a few minutes of your time. Just head to your nearest SM Mall and look for their SM Business Center. I'm really not sure if even the small SM centers have this, but it's best to check it out yourself. I visited the nearest one in my area - SM City North EDSA which is a short 15 minute walk from my place. Once your arrive at the SM Business Center, you can request for a copy of the request form for you to fill out. Normally, they have separate lines for those doing government transactions and those paying for normal utility bills. The form they use are the same as the one used in NSO offices, they just have this additional paper where you need to copy the information you put in the official request form as well as the number of copies you are requesting, this will be SM's copy. Make sure to make every information accurate! Once you're done, you need to pay at the cashier. Payment for your birth certificate copy is 140php each, same as when you request directly at NSO, SM charges an additional 20php service fee on top of the 140php for EACH copy, not per transaction. Since I requested 3 copies, it's 420 + 60 = 480php. Also note that there's a cut-off time daily for processing government documents, I think it's 5 or 6pm. Here's the catch, if you are not in a hurry, SM Business Center's service is good for you, if you're in a hurry it's not. You will have to wait 4-6 business days before you can come back to the SM Business Center where you filed your request. Upon claiming, you need to present the receipt and claim stub given to you when you filed your request, you'll also need to present 1 valid ID. In case you can't claim it personally, your proxy should have a valid ID, your valid ID, and your authorization letter. They will get the authorization letter and attach it on their file for NSO. do they also accept applications for the unified ID? Bam!!!! hahaha need ko to, naghahanap ako kung san meron. Thanks sa post mo! haha :) miss you bam! No problem, miss you too ingat lagi! Thank you Rizajune! Glad it you find this helpful. For Makati City, it's at the Ground Floor, Makati City Hall (Old Building), Jose P. Rizal Street, Makati City with telephone number: (02) 895-14-18. Thank you for visiting and I'm glad you find this article helpful. can we request for marriage certificate din through sm business centers? If I will be getting a NSO Birth certificate in NSO service center for a friend do i still need an authorization letter and a his alid ID? how is the processing if i want my nso birth certificate to be corrected? my mother's name on my nso is Elaiza while her real name is Eliza. is there a charge for it? how much would it be if ever? How much po payment if sa sm business center aq kumuha ng nso? pwede po ba student id? Hi! Ask lang po.. 4-6bussiness days lang po ba daw tlga sa sm?? Based on my experience and what the cashiers in SM Business Center told me, it's 4 to 6 business days indeed. It might vary from branch to branch though, especially those in the provinces. hello po ask ko lang po puwede din kaya kumuha ng certificate of no records sa mall?? need ko po kasi certificate of no records for my baby..
what if wala id pwede ba police or brgy clearance? Kapag nawala po ba yung claiming receipt, pwede pa rin po bang makuha yung nso bc? Aside from BC, do they also accept CeNoMar requests? This post is really helpful but only to the fact that it forgot to indicate that SM NORTH has a cut off processing time of 5pm. It was really a waste of my time when they told me about their rules. I arrive their around 6:30 pm since I still have work. Sorry about that, but I indicated on the post that there's a cut-off but I'm not sure if it's 5pm or 6pm. If you're getting an NSO Birth Certificate of another person, you'll need to give them a photocopy of the person's ID, a photocopy of your ID, and an authorization letter of the owner of the birth certificate. I'm really not sure, it's best to bring additional ID's. hi! tanong ko lang po kung pati saturday & sunday nag-a-accept sila ng pagkuha ng nso ? Hi, would you have an idea on how long they keep the certificates? I filed mine last year at SM Sta Mesa and lost my receipt. It's best to inquire about this in the branch where you requested a copy. As for the ID's, valid government ID's are accepted. Hi, 140 pa rin ba ang singil sa SM? kasi sa NSO online 315.. free delivery naman yon. Salamat! It's 140 + 20 service fee, so total of 160 per copy. You need to pick up your birth certificate copy after a week. Hi, I would like to ask if the NSO birth certificate released thru SM malls are already certified true copy? If not, how can I make it to a CTC as required by my employer. The NSO birth certificate released by SM are certified true copies that came directly and processed by NSO. do you know how much the amount of fee for travel abroad purpose? same price din po ba yun? I think it's the standard price whatever purpose you will use it for. does SM BUSINESS OFFICE open on weekends? Yes, during malls hours. It's best to ask your nearest branch though as some doesn't process on Sundays. Are you registering your baby or is the baby already registered? pwede poh bang magtanong?magkano na po ngaun ang nso birth certificate? Yung sakin po dalawang copy ee . Magkano po kaya yun ? Yung front po tsaka back .. nung kumuha po ako before ng nso dalawang copy ang binigay sakin ..
hello po hnd po ba ako mkakakuha ng NSO pag wala akung id ? Yes, a valid ID is needed when requesting a copy of your NSO birth certificate. Hi . Is it possible po ba na makuha sa ibang branch ng SM ung NSO? Kasi nagbayad ako sa SM MANILA during my school days, since graduate na ako and I'm from cavite, I can't go to SM manila .ano po pwedeng gawin? Thank You. No that is not possible. You need to pick it up on the branch where you applied. For your anak, I think it's okay but for your asawa, you need to bring an authorization letter that authorizes you to get a copy. I think they don't have NBI processing at SM Business Centers but you can pay your NBI fee there for online processing. Hi. Can i apply for my newborn baby's nso birth cert in sm business centers? No you can't. You need to process it in your nearest NSO office. 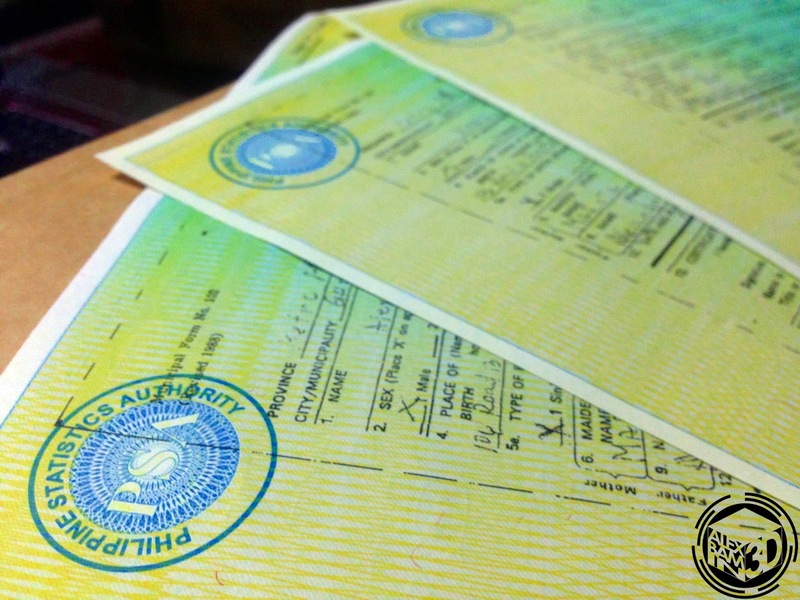 NSO processing on SM Business Centers are only for those requesting for copies of existing birth certificates. May I ask if you know the requirements for applying my baby's nso birth certificate? hi just wanna ask anong services ang gngwa nila para sa SSS philheath at atbp? Hi pwd po ba makakuha ng cenomar sa sm service center? I think I saw recently that you can indeed get a copy of your Cenomar in SM Service Center. Still, this will vary from branch to branch so I recommend visiting the one nearest your place to inquire. hi ask ko lng if pwede b ako mag request ng marraige contract ng partnert ko? Sa pagkaalam ko, kailangan mo ng birth certificate mula sa Civil Registrar ng iyong lungsod. Sila ang nagpapasa nito sa NSO. Kapag meron ka nang kopya ng birth certificate si Civil Registrar ng iyong lungsod, malaki ang posibilidad na meron ka nang kopya sa NSO. Para makasiguro, maari kang bumisita sa malapit na NSO office sa iyong lokasyon. Im 17y.o. Am I allowed to get mine pati sa kapatid ko!? san naman po ung pinakamalapit na pwede pag kunan ng NSO yung 1 day lang po tiga bulacan po ako salamat! Maari mong tignan ang pinakamalapit na NSO Center sa iyong area, normally you can get your copy in a few hours. hello po. saan po pwede magrequest ng NSO Birth certificate then within the same day matatanggap yung ni-request? rush po time ko please. thank you. Best way is to visit your nearest NSO Office since they can print a copy on the spot. hi, open ba kapag sunday? pwede ba nbi clearnce sa pag kuha ng nso brthcrtfcte? pwdi po ba baranggay clearance para sa pagkuha ng nso? Hi, Sir! If ever birth cert ng parents ko irerequest ko? What requirements do I need to bring po kaya? Nasa probinsya po kasi sila, I have no IDs nila and anything. Thanks! Pwede po bang magtanong buong 160 na po ba babayaran o 20 po muna tapos pag kukunin tsaka po magbabayad ng 140. What if walang valid id? Acceptable po ba ang student id, kahit expire na? If Kaka18 pa lang? Yung police clearance kelangan updated? For claiming your NSO Birth Certificate? Yes, your Police Clearance ID should not be expired for it to be valid. what if, i lost my receipt and claiming stub? Hello, I just wanna ask if they need requirements pa? For requesting, no requirements just the filled out form provided by SM. For claiming, you need 1 valid ID if it's your birth certificate and authorization letter - it it's for someone else. Hello bukas po ba ang NSO east ave every saturday? Saka if tatanggapin nila ung xerox id and authorization letter? hello, sa sm manila ba pwede ring magtransact ng NSO birth certificate? Not sure if there's an SM Business Center in SM Manila. Best way is to drop by and check if they have one. Can i get my nso on weekends on weekends at sm?? This will depend on your chosen mall. Please visit your nearest SM Business center to inquire weekend processing. Processing takes 5-6 business days. okey lang po ba kumuha ng nso copy kahit walang copy ng lumang birth certificate? nasunugan po kasi kami eh. Yup, that is possible. Just present a valid ID when you claim the copy of your Birth Certificate. Since there is no record of my birth certificate at the main office of the NSO in QC, I requested the Local registrar in the city where I was born to endorse my birth certificate records to NSO main office. How would I know if the NSO main office already received the endorsed birth certificate records? Is there someone in the NSO main office whom I can call to verify if the endorsement has been received? Hi po, ask ko po meron po bang nso sa SM FAIRVIEW??? Thank you. As for your second question, you need to personally pick it up on the branch where you submitted your request after 4-6 working days. Unfortunately, this blog is not affiliated with NSO and I cannot answer your question. ask ko lang sana kpag kkuha po ako ng BC ng pamangkin ko pero wala xang kahit anong id kasi kkstart lang nya sa skul..pwde po ba akong kkuha. ?ano pong mga need...TIA.. I think you'll need an authorization letter from his parents. hello po..yong requirements ba na authorization kelangan pa orig. or kahit scan lang?kasi wala ako sa pinas eh..balak ko sana e send nlng email sa kapatid k0.. I think scanned copy might be okay, but to be sure, please ask your relative to check with local NSO office for requirements. bakit po kaya ung typewriiten kong marriage certificate ayaw tanggapin sa renewal ng prc id ko..
Not sure about that, it's best to inquire directly with NSO / Census regarding your concern. You need to directly contact / visit NSO regarding that concern. SM Business Centers does not do that kind of service. Hi good evening po, tanong ko lang may malapit ba NSO sa Valenzuela city? Thanks! Not sure about that, better check the Census website for list of offices. You need to provide an authorization letter from the parents and copy of their valid ID. do they also process nso marriage cert? thanks a lot! Not really sure, better ask NSO directly. Thanks for your time and effort in assisting us. God bless. You're very much welcome. Cheers! Hi good am.May Mali po sa NSO certificate ko tama naman po yung birth certificate ko pero pagdating sa NSO nagkapalit ang surename at middle name ko.at ang sabi ng nso brance ng Los Banos laguna ay pumunta ng NSO main office.Hindi ko po kasi kabisado ang manila. Ask ko Lang kung merong ibang brance na nagpaprocess ng ganitong problem?. Salamat Po! I think for issues like that, you really need to visit the NSO Main Office. They just moved their office to Manila near LRT Pureza Station, their East Avenue branch is now closed based on the news. Eh Cenomar nag iisue sila ? how much kaya ? Saw recently that they also issue copies of CENOMAR although I'm not sure if all branches do this. Best way is to visit the one nearest you. Meron po ba sa megamall? ?or san po malapit sa mandaluyong pwede mgrequest? Most likely there is one at SM Megamall since it's one of the major malls in the area. 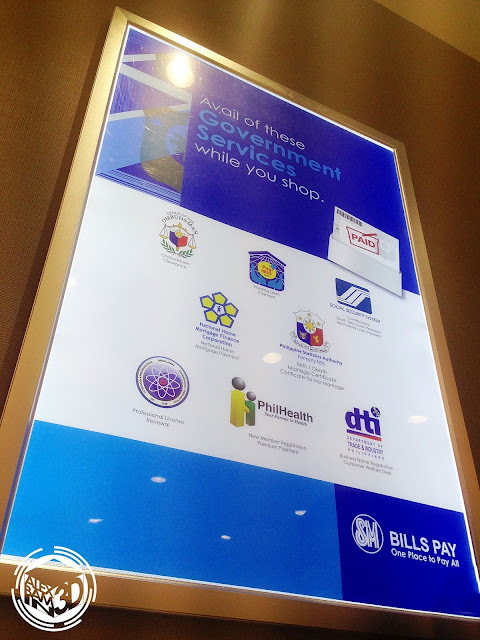 It's normally located inside the department store, but best to ask the concierge when you visit Megamall. Ask ko lang po ano pong reg.pag kumuha ng birth cert. Kasi ikukuha ko po sana cousin ko pero nasa abroad po sya. Tanong ko lang po pano kung NSO marriage certificate , nagproprocess din po ba ang sm and 1 day lang po ba makukuha na? Thanks in advance sir. Not sure if they issue Marriage Certificate copies at SM Business Center. As for your second question, it takes 4-6 days processing before you can pick up your requested document. Unfortunately, I don't have any idea for your area - best to search on NSO's website. 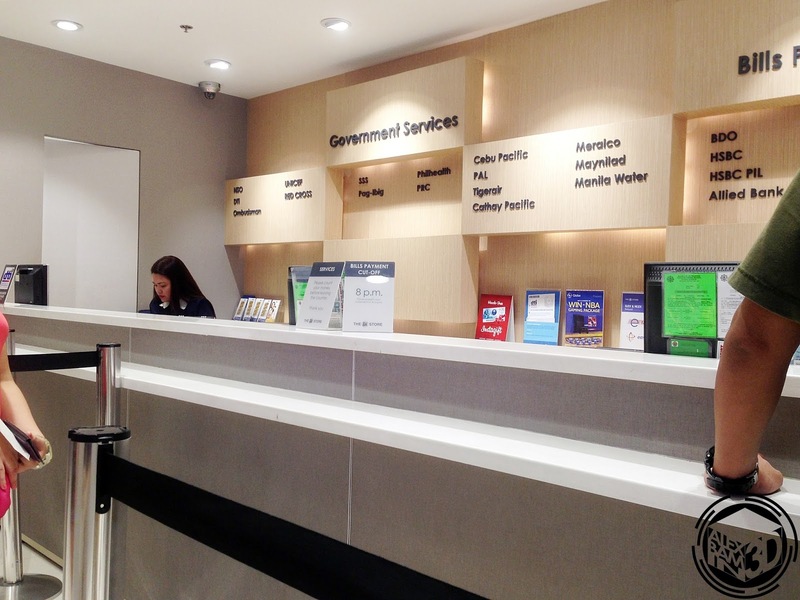 Yung sa DTI ng sm city north edsa pwede ba ang new registration? Or renewal lang sila? Sorry for the late reply but based on the date you commented - November 30th is a National Holiday and all government offices including NSO is closed during holidays. Hi, i will request for a NSO. But i dont have valid ID. Magrerequest ako ng NSO for my Passport and POSTAL ID. I do have an ID my school ID. Pero di nako nag aaral. Pede ba company ID? Do they still have it in SM North Edsa until now? Also, meron bang parush para i dont have to wait 4-6 days. If yes, how much po? Yes, the service is still available in their Business Center. As for rush processing, I don't think they offer that service. 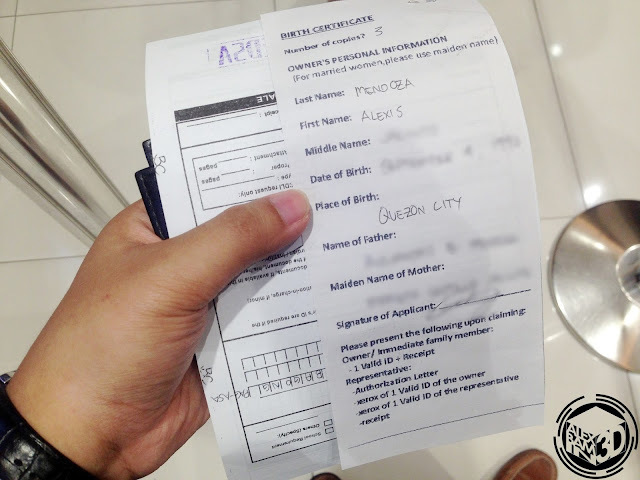 Can I get a certified true copy of my birth certificate at SM Sta.Rosa, Laguna? Its 2017, and I find this post very helpful. Thanks Ryan, glad you found this post helpful. Happy New Year! Kaya po kea nila mag issued ng CENOMAR in 1-2days? is it still available until now? in what floor po sya located? and is it available also in weekends? Cut off time po nila ng 3pm, I dont know if it depends kung saang branch ng SM.